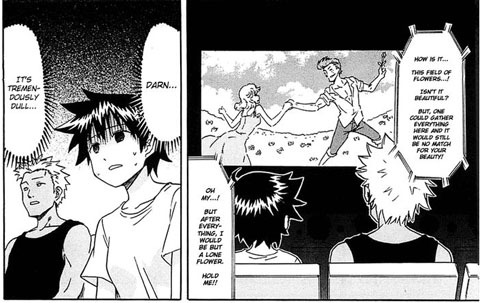 I think it goes without saying that most comedy manga, if not most media in general, have a romantic element put in. Maybe it’s for the added ratings, maybe it’s the size of the cast or any other reason. 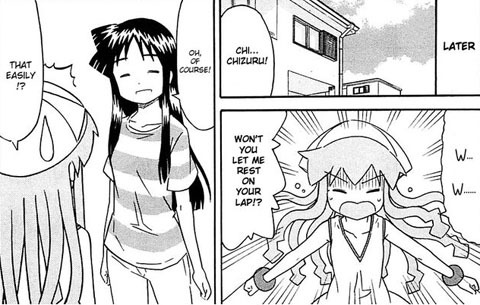 Since I read comedies like Hayate and Yandere Kanojo which have a big focus on romance, the scenes in Squid Girl that focus on it seem small by comparison. But having small romantic subtext is far from having none at all, and I’ve noticed a surprising number of different pairs in this series. Let’s start with the pair this chapter focuses on: Chizuru and Gorou. Gorou’s unrequited crush is one of the more obvious ones in the series, and luckily it isn’t as in your face as Sanae’s attraction to Ika. I was never all that sure that sure whether Chizuru felt the same way or even acknowledged he had feelings. This isn’t even the first date the two of them have been on, and she’s still keeping us in the dark. Despite this, of all the potential couples in the series, these two are the only ones I could ever see getting together. They’re probably two of the most adult characters in the series, at least in terms of maturity, so they’d probably handle it better than the others. In contrast, I’ve heard a few people mention Nagisa having a crush on Gorou, mainly because of the chapter/episode where he rescued her. Even back then, I had my doubts that this was true. She honestly seemed more concerned with the relationship between Gorou and Ika than with how he feels about her. Now I have to doubt that even more, because this chapter called back to the previous one by having Nagisa try to pay Gorou back, and her first thought is to set him up with Chizuru in an incredibly cliche way (her words, not mine). Now I’m no expert, but usually when you attempt to set up someone without telling them and without stuttering like crazy, it’s a good sign you aren’t all that interested. That said, I’m not 100% convinced that she isn’t interested in him yet. It’s certainly possible that she’s strong enough to not let her attraction get to her, which would be a lot more subtle than most other crushes you see. Now that I think about it, this isn’t the only case of a crush too subtle to register. 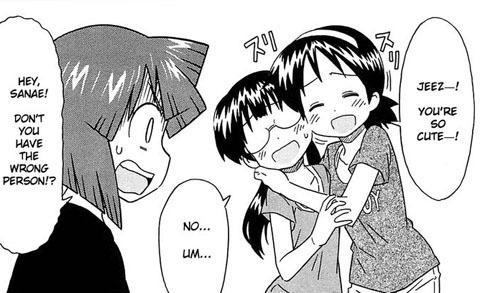 I read something on TvTropes about Ayumi, the girl with the fake Ika head, having a minor crush on Eiko. I didn’t notice it that much before, but I guess it’s possible. That’s the strange thing about this series: the romantic subplots actually vary in intensity. You have these quieter pairs, you have someone like Isozaki liking anyone with breasts, and of course there’s Sanae. Of course the series will likely never go too far down the romance path, but just the fact that the characters actually have variety to them, rather than nursing the same crush on the same person, is kind of refreshing. And who knows: maybe we’ll be seeing a few more unrequited feelings added to the mix. Perhaps sooner than we think. Posted on December 2, 2011, in Chapter Discussions, Invasion! Squid Girl, Series and tagged Chizuru Aizawa, comedy, Gorou Arashiyama, Ika Musume, Nagisa Saito, romance, Squid Girl. Bookmark the permalink. Leave a comment.